If you post to a WordPress blog on a regular basis like I do on In Photos dot Org you’ll no doubt recognise the fatigue that comes from adjusting the publish date every single time on a new post so it appears a day later. If you have multiple posts like on a daily photoblog you have to remember what day the last post was made and adjust the date accordingly. A few years ago I wrote a small plugin that I never released to help schedule posts. In the media uploader you could select multiple photos and click a few buttons to be brought to a new page where you could enter title, content and tags for each image. Based on this experience, I suggested it as an idea to one of the teams at Automattic who built Post Bot. I used that for a long time and it has its strengths. If you’re posting content that has the same or similar tags you can copy and paste the tags from one post to another. I posted lots of black and white street images from my home town this way and it was super useful! I got tired of manually typing out tags, and unfortunately the site broke a few times, with posts not scheduling or one time they scheduled all in one go. Luckily the problems were quickly fixed. However, I started using the WordPress post editor again and scheduling a bunch of photos that way. Manually editing the publish date quickly became a chore. Lazarus, the form saver Chrome extension, would sometimes popup if I didn’t click exactly on the date, or as I said before I had to remember when the last post was made. They say there’s a plugin for everything, and there is for this too. Check out Publish to Schedule. 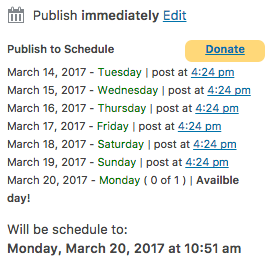 You tell “Publish to Schedule” which days and how many posts should be published and when you go into the post editor the next available date is picked for you! The date doesn’t change until you hit Publish but I already used it to schedule a number of posts and it works really well. Odd games of bad company 2!